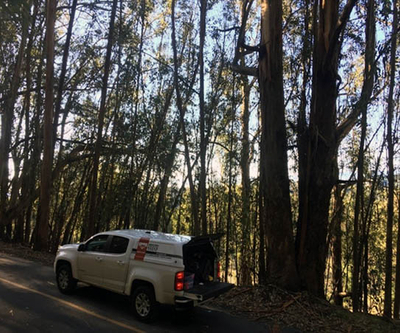 Utilizing the latest in Ground Penetrating Radar (GPR) technology and Radio Detection, Greg Milburn of the GPRS San Francisco/Oakland office, responded to the site and was able to mark out various utilities traveling through the proposed excavation area. Scans were taken with the GSSI 400mhz antenna, combined with the RD7000 radio detection device to search for electric, gas, communication, water, sewer and unknown lines. GPRS findings were then marked directly onto the surface in real time for the customer to see. By utilizing GPRS, the customer was able to identify underground utilities and other subsurface obstructions in the area in a nondestructive, safe manner. The use of the professional services provided by GPRS allowed the customer to excavate promptly and safely, while keeping their project on schedule. Please contact Ground Penetrating Radar Systems, LLC (GPRS) to find out how we can assist with utility locating on your project. To locate underground utilities such as power, gas, water, communication, sewer, please contact us today. Our expert Project Managers are highly trained and OSHA certified, equipped to serve your project of any size throughout the San Francisco and Oakland areas. Please contact Greg Milburn at (925) 332-6472 or greg.milburn@gprsinc.com for a free estimate and to learn more about how GPRS can assist in your projects. We are dedicated to helping our clients solve problems and answer questions during your pre-planning phases as well. To learn more about how Ground Penetrating Radar works or have questions about an upcoming project, please contact Area/Market Manager Mike Brown at (916) 539-6492 or mike.brown@gprsinc.com. Don’t forget to ask about our concrete scanning services, to locate post-tension cables, rebar and conduit.